Whew, the season is in full swing!!! It was hard to find the time for the next portion of information for those interested, the season is in its peak and there is always a full waiting room of those willing to purchase a new “suit” for their floating wonder. Not much time remains for additional activities and thus I did not submit my text for the July issue to Paweł Wojna. This time, I made Paweł wait a bit, but in the end I came through. What is the topic for today? There is one topic that comes back to us like a boomerang when taking orders for new sails. It is the sail area. One such glaring example is the sails for the Polish Omega class sailboats. Everybody knows what it is, even those who don’t know. Omegas in the form as we see them today have been sailing for a long time. At to the details, as previously, I send you to the website of the Omega Class Association (www.omega.org.pl). But today, everybody who manufactures Omega class sailboats (incidentally, from what I know, only Jędrek Szynkiewicz from Barlinek has full and legal blessing of the late Juliusz Sieradzki for manufacturing Omegas) states the area of the sails as 15m². 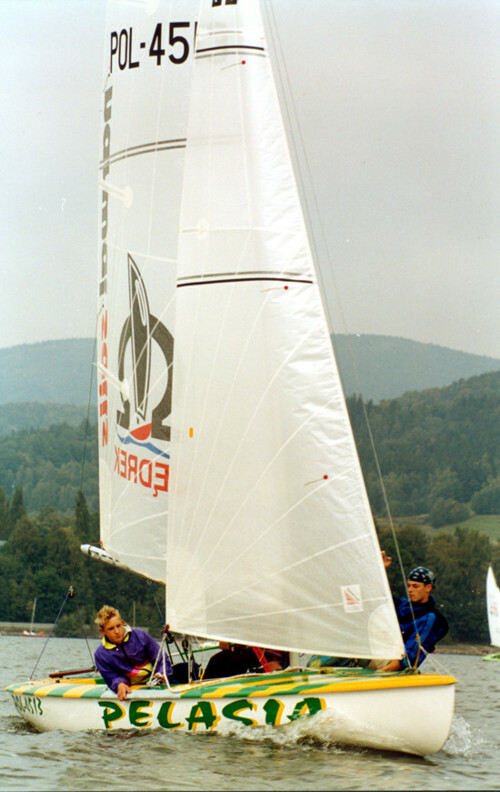 Sails for Omega class sailboats made according to the class rules can have up to 18.7 m² (mainsail and foresail). Such a surface is achieved when making sails for racing boats. To be clear – for recreational boats, sets of sail from the “Narwal” sailmaker’s shop have less than 18m². The difference stems from two reasons. First reason is the additional gore on the foot of the mainsail in racing sails (we call it a “drawer” because when sailing by the wind it folds like an accordion, while when running free it shows all of its glory). The second reason is that the sets for recreational sailing are flatter than racing sails. And this is the whole truth about the surface of the sails for OMEGA class sailboats! 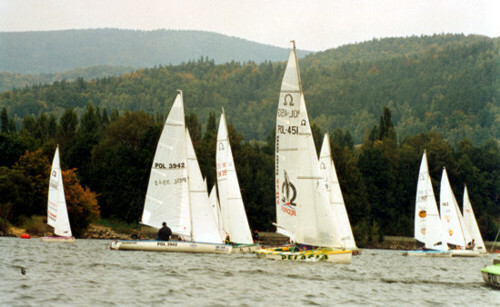 On the website of the Omega Class Association (omega.org.pl), 15m² sails are also listed in the technical data (this regards the comparison of the first Omegas with Chesapake 20, a boat on which Juliusz Sieradzki supposedly based the original Omega). How big was the sail of the historical Omega from the 1940s, its first models, is now a mystery. If someone has the sails from such a boat at home, it would solve one of the mysteries of the twentieth century, to show them publicly. If anyone has plans of the sails for the original Omega, please contact us, for me this is one of the unsolved mysteries. Personally, I think that it had about 18m², even if Juliusz Sieradzki wrote down 15m². 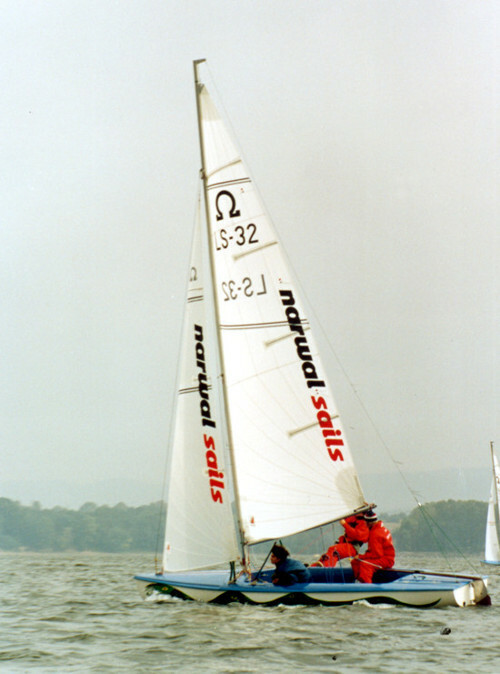 To this day, most sailboat builders, specifying sail area on their designs, when listing the areas of the mainsails, usually calculate them on an triangle. Also, often they state the deflection value on the leech, but the area still does not agree neither after taking into account the deflection, nor without taking it into account. The only positive exception, which I came across recently when making sails according to a design made by a sailboat designer, is the Mantra 8.5 by Andrzej Armiński. There, the area of the mainsail includes all the excess material added by the sailmaker and agrees almost perfectly with the area of the finished sail. The remaining designers do not add the excess material at the luff, foot and leech. They probably assume that the sailmaker will do it his own way anyway, so there is no need to reinvent the wheel. State the areas of sails above as “up to 18.7 m²” and “less than 18m²”, I deliberately did not state that they have exactly this and that much. But returning to our topic – minor differences among sets of racing sails are primarily due to the quality of the mast on the given vessel and the version of the foresail. The mast – if it can be bent not with a tank suspended on top, but using shrouds and tension force on the mainsail sheets, then the area of the mainsail increases, because we make a deeper mainsail in order to maintain the class dimensions. A deep mainsail gains on the area at this point, a flatter mainsail will have a smaller area. The differences are not big – in this case they amount to approximately 0.3-0.5 m² at the most. A racing mainsail will have an area up to 11.9 m². As for the foresails, the range of the area here can reach up to 0.5 m². On traditional foresails, the leech is usually slightly concave. This prevents the leech from flapping, and allows for flattening the top part of the foresail when sailing by the wind. If the sail has battens, the leech can be straight and the area will automatically increase. Such differences may arise also in case of sails for recreational sailing – rarely, but still. When writing this I contacted Włodek Radwaniecki – the president of the Omega association, in regard to the history of the area of sails for this class of sailboats. And just like the few decades under the rule of this happy-go-lucky government distracted the nation to the point that we will still be getting over it for a long time, so the several years of this specification for the area of Omega sails resulted in the fact that if today we tell an owner of an Omega that his new sails will have an area of 18m ², he will be a bit surprised. This topic could be continued in relation to other sailboats, both racing and recreational. For comparison, I made a list of sail areas for several popular racing and recreational sailboats. The list includes sail areas popularly considered as obligatory and those which can be achieved without violating the regulations. As you can see above, the differences are both in case of racing and recreational sailboats. There are differences, and quite significant, even where the measurement formula is strictly defined. The conclusion is that we should be cautious in relation to the sizes of mainsails, gennakers and spinnakers stated by builders of sailboats in their designs, as well as the sizes of racing sails. In case of racing sails, more important then the area of the sails are the correct class dimensions and the shape of the sail consistent with the requirements of the skipper and the crew.